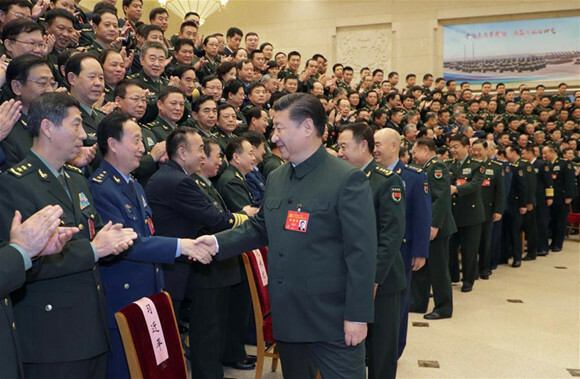 Xi, also Chinese president and chairman of the Central Military Commission (CMC), urged the army to remain true to its original aspiration and keep its mission firmly in mind. Xi said that during the past five years, the CMC has endeavored to build an army that follows the command of the CPC, is capable of winning battles and has a fine style of work. It has been upholding the Party's absolute leadership over the armed forces, innovating military strategy, governing the army by law and promoting civil-military integration. Xi praised the 19th CPC National Congress a success, saying that by the year 2020, mechanization will be basically achieved, and the modernization of the national defense and armed forces should be basically completed by 2035. To study and implement the spirit of the congress is the primary task for the party, the country and the army at present and in the years to come, said Xi. He urged military officers and soldiers to learn from the report of the congress as well as the Party's Constitution so as to better guide their work. The President asked the members of the CMC, newly chosen at the first plenary session of the 19th CPC Central Committee, to be keenly aware of the trust bestowed by the Party and people and the expectations of all servicemen and women and spare no effort in their work. Senior officers, as the backbone of the campaign to build a strong army, should be loyal and obedient to the Party, be good and smart at combat and endeavor to reform, Xi said. They should be efficient in commanding their forces, strict in discipline and set an example by performing their duty with spirit and diligence, he said.